Dynamic Staffing, Inc., as a large regional provider of quality temporary and staffing services, delivers a dedicated workforce to clients across the southeastern United States in various positions from manufacturing, aerospace engineering and heavy industry to medical specialists, accountants, professional placements, and of course, traditional reception assignments. Whether your desire is for Temporary assistance, “Temp-to-Full Time”, “Temp-to-Hire” or direct payroll support, Dynamic Staffing is prepared to deliver service tailored to your needs. While Dynamic prides itself on nearly three quarters of a century providing such service, The Dynamic Approach is about customizing our deployment to fulfill the expectations of each client and focusing our entire Team on shaping our service to that goal. The Dynamic Approach begins by forming strong lines of communication with our client contact, ensuring an understanding of our valued client’s objectives, turning those goals into a regimen of recruitment, training, supervision and ongoing multi-layered support. Each candidate is prescreened and assessed by one of our Project Coordinators. Through the provision of background screens, aptitude evaluations, computer skill exams and drug testing for each of our applicants, we determine their viability and skill level in order to ensure that an employee is “matched” with the appropriate job order. The resulting employees who are assigned to a service location are covered by Worker’s Compensation policies, Liability Insurance and Unemployment Insurance. The talent represented in Dynamic Staffing’s management spans a broad spectrum which includes career Staffing & Placement Professionals, CPA’s, Commercial Recruiters and a senior staff with over 50 years of experience in this industry. Each of these Team Members consults with our customer in order to effectively recruit, assign and customize procedures to fit with your needs and establish firm lines of communication. We take tremendous pride in our ability to recruit, to train, and to retain a quality minded workforce and provide unrivaled service. 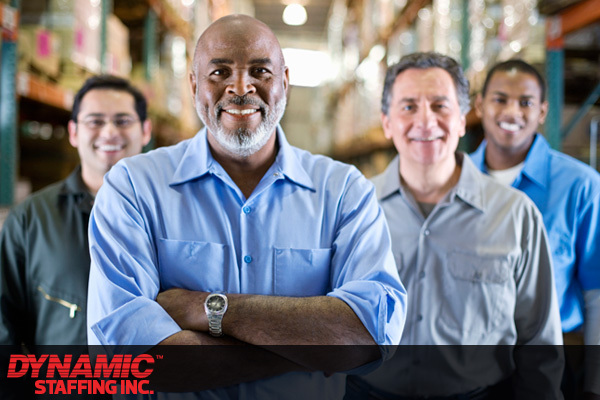 It is Dynamic’s charter to supply properly equipped employees through focused and quality driven service in our Clients’ facilities. With a workforce comprised of thousands of employees and numerous offices throughout your region dedicated to fulfilling the needs of our valued Clients, we at Dynamic Staffing will tailor our services to the unique requirements of our customers, conquering any issues to cultivate a partnership with you and grow an enduring business relationship. The Dynamic Team would be excited to communicate with you about your Staffing or Security needs. We encourage you to contact a member of our team, and allow us to put together a customized proposal for service for your company or organization. Dynamic Staffing, Inc. is committed not just to providing the best service possible to our clients, we also strive to do business the way we live: responsibly, resourcefully, respectfully. You can read more about our Green Initiatives here.